Welcome to Grand Tavern! We’re your one-stop spot for food, fun and excitement every day of the week! 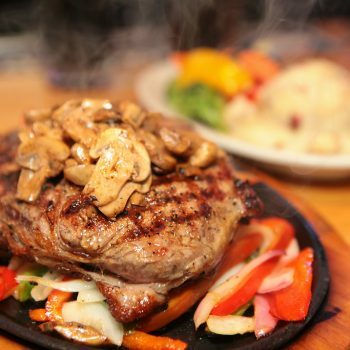 Come on over and enjoy our superb and diverse menu that features such favorites as big burgers, BBQ salmon and rib eye steaks! 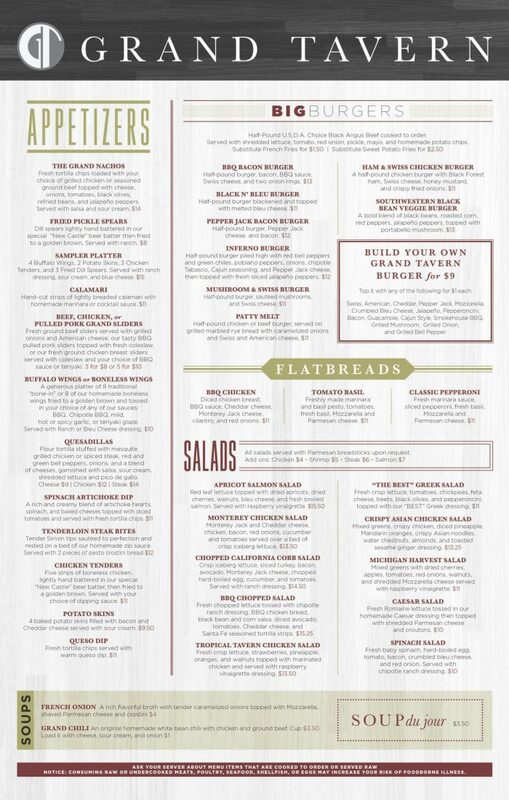 If these selections don’t tantalize you, join us for our wonderful soups and salads, sandwiches, appetizers and drinks. Happy Hour is really happy at Grand Tavern! With 25 flat screen TVs we’re your source for TV entertainment, especially for sports! 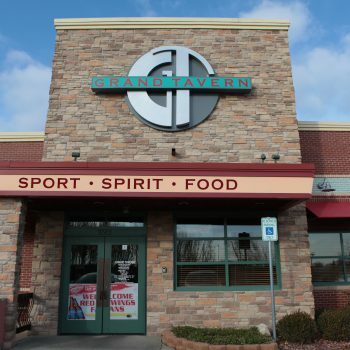 Bring the gang over and enjoy an afternoon or evening of fun here at Grand Tavern! with purchase of 2 entrees and 2 beverages. 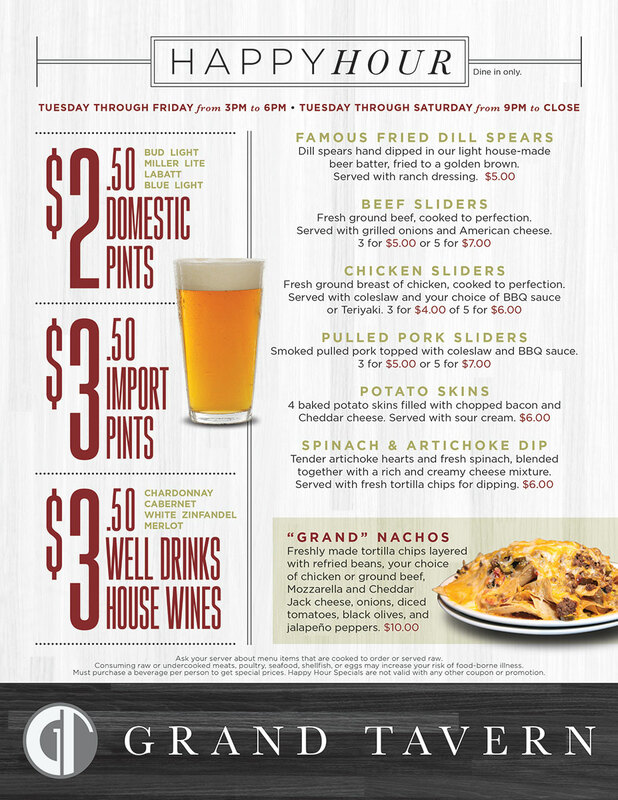 Grand Tavern Rochester Hills, offers some of the best Happy Hour and daily deals around. From our Popular 9 for $9 daily special, to our all you can eat fish & chips Fridays. We have something to offer for everyones tastes and budget. Lightly breaded fried shrimp, BBQ, coleslaw, and crispy onion straws. Served on an open sub bun. Quarter pound blackened burger, grilled to your liking and topped with pulled pork, bacon, and melted pepper jack cheese. Served with lettuce, tomato, onion, and mayo. Crispy flour tortilla, pico de gallo, jalapeños, grilled chicken, and melted cheddar jack cheese, served with salsa and sour cream. Roasted beef, caramelized onion, melted cheddar cheese, and horseradish spread on ciabatta bread. Deep fried chicken tenders, melted cheddar cheese, topped with lettuce, tomato, and mayo. Served on a hoagie roll. Salami, capicola ham, pepperoni, banana peppers, tomatoes, lettuce and provolone cheese served with a side of Italian dressing. Fresh Atlantic cod lightly dusted in flour and deep-fried to perfection. Stuffed in a sub bun with lettuce, tomatoes, and tartar sauce. 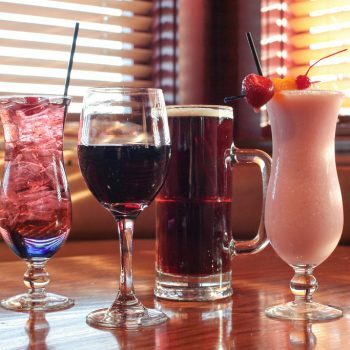 A cup of our soup de jour accompanied by a half portion of your choice of any one of the following: Tuna Salad, Tropical Tavern Chicken Salad, “The Best” Greek salad, or Chicken Caesar Salad. Served with a warm Parmesan bread stick. Home-made bistro tuna salad with crispy bacon, grilled marble rye bread with American cheese, Swiss cheese and bistro sauce. We invite you to join the Grand Tavern Email Club. Sign up today and receive a $15 Gift Certificate to use on your next Birthday! *Redeemable on your birthday with valid ID. Limit one gift card per person per year. Offer cannot be redeemed for cash value. Dine in only. Valid at participating locations only. Your email address will not be sold or otherwise distributed. By signing up to us , you are opting to receive ongoing info from Grand Tavern, 5th Tavern, & PictureThisCity. You may unsubscribe at any time.  “This restaurant is my go to lunch place. Excellent service, fantastic food, great selection all at a great price. 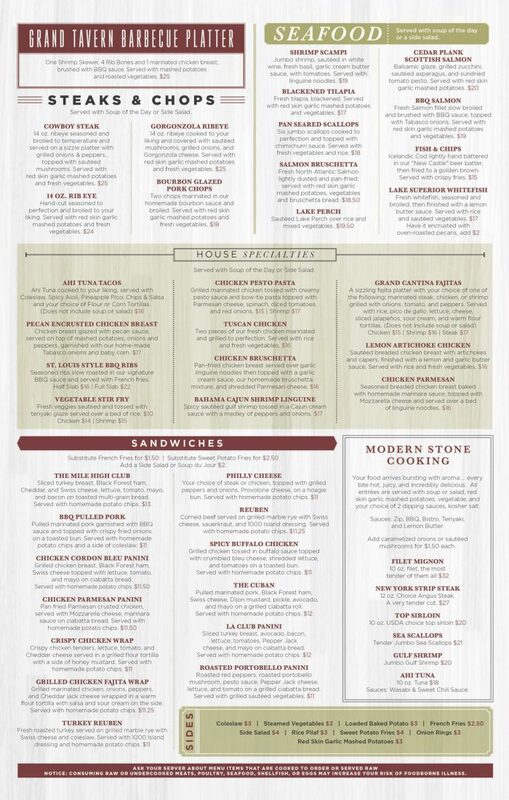 You can not go wrong at The Grand Tavern. 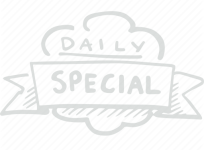 There Weekend brunch special is best kept secret around. Simply fantastic.